Column and post pads are poured on the existing floor. 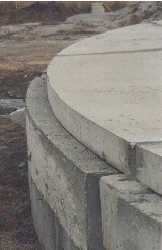 A precast concrete support system consisting of posts, columns and beams is set in place. Interior view of precast concrete support system for precast cover system. A decant structure is cast-in-place on the interior of the tank with an overflow located at the top. Four (4) levels of decant draw-off are built into the structure to provide multiple levels for decanting. Precast panels are set in place. Each tank is field measured prior to fabrication. Each precast panel is then built to very strict quality control standards so an almost perfect fit occurs when the panels are placed on the existing tank walls. After placement and alignment of panels, a cement grout is placed to fill any void space between the panels. 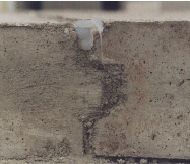 Top joints are then raked to a depth of ½” and a self-leveling polyurethane joint sealant (Tremco THC-900) designed to resist moisture, abrasion and movement is placed on all top joints.